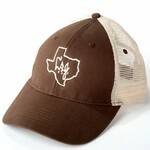 Brown cotton in the front and polyester mesh in the back. State of Texas and LBJ's initials (also the Ranch's brand) set inside the state of Texas. One Size.